If you haven't tried adding card making embellishments to your cards you're in for a surprise! Embellishments are the finishing touches that add that extra something to make your cards shine. They are designed to enhance and add interest. They're supporting players not the star cast. With this in mind add your embellishments subtlety to avoid dominating your main focus. The rule of odd numbers is thought to be more visually appealing. For example: add 3,5 or 7 sequins for a natural and balanced look. Ribbons are available in an array of colours, widths, materials and textures. They are used to add bows and ties. Ribbons soften a card and are great for weddings, birthday and baby cards. Ready made ribbon bows can be purchased to save time and your fingers! If you have arthritic or stiff fingers it may help to buy or make a bow maker. There are lots of examples on Pinterest. This video shows how to tie a bow with a homemade bow maker. Bakers twine is easier to tie as it's thiner and less slippery. Although available in a multitude of solid and combined colours the plain natural jute remains a popular and versatile choice. These jewels add sparkle and a touch of glamour to your cards. They come in all colours, shapes and sizes. They are sold on sheets and are self adhesive. Occasionally, a little spot of wet glue is needed for a permanent fix. Get more out of your jewels by buying clear or neutral products and colour with alcohol markers. Collect and press your own flowers and leaves for a delicate vintage look. For those of use who are time challenged you can buy paper flowers and leaves in a a variety of styles and colours. Alternatively, have a go at making your own using punches and dies. Adding glitter is a cheap and potentially messy way to add sparkle! Easier sparkly alternatives include using glitter paper, glitter pens or heat embossing with a metallic embossing powder. You can also add a glittery shine with sprays, glossy and glitter accents. Gilding Flakes are decorative flakes that add a subtle metallic shine. These too can be messy but the finished effect is stunning and luxurious. 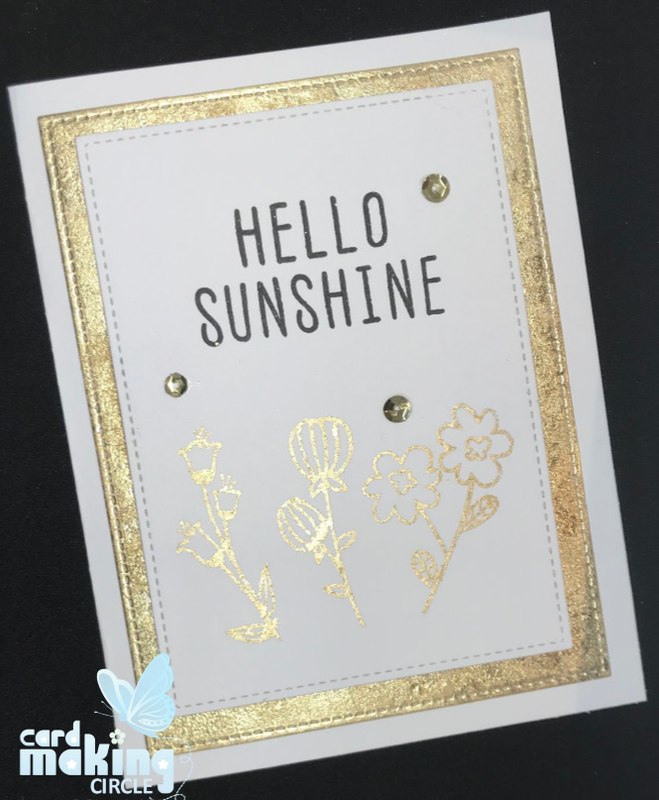 I used Gilding flakes and the Hello Sunshine stamp set from Altenew to create the shiny elements to this card. Be warned the flakes do fly around a bit even when you open the container as they are tightly packed inside. Stamp flower images with Versamark ink. Sprinkle Sticky Embossing Powder (from Ranger) over the images. Heat quickly with a preheated heat tool until the powder melts. Lay the card onto a tray or into an old shoe box to apply gilding flakes to the embossed images. This is to stop the flakes flying around - try not to sneeze or cough as it will send the flakes flying! Sprinkle the flakes over the embossed images and lightly pressing the flakes with your finger. Once the images are covered use a soft clean brush to remove excess flakes. The border was created in the same way. Instead of stamping the Versamark ink was smeared over the edge of the paper to create a frame. 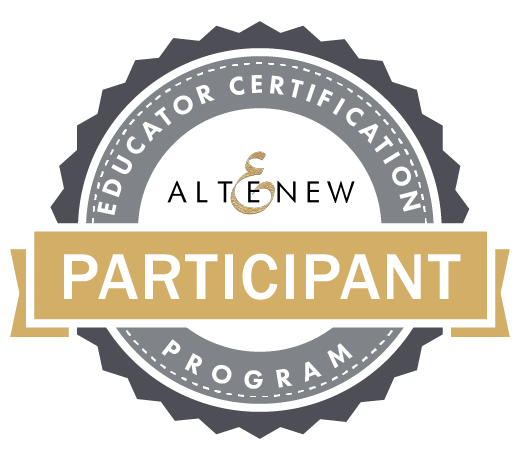 This technique is explained in detail on a video from the Let It Shine class at the Altenew Academy. The list of embellishments is endless! And finally....remember to use all your glitter or shiny paper scraps to punch your own stars, hearts and circles. 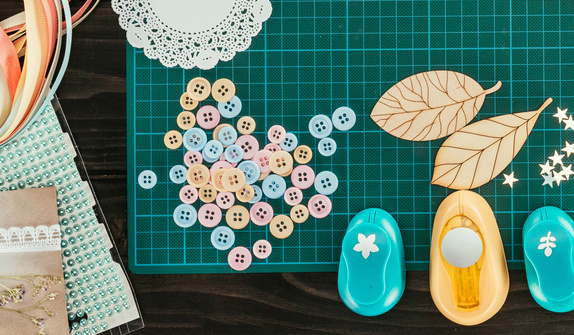 Create a stash of ready to use embellishments.